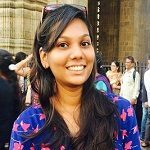 I am Nikita Sarawagi, an international student from India, pursuing my Master's degree in Data Science and Analytics at Maynooth University. I believe in the saying 'Live and Let Live'. I am a nature lover and always looking for flexible approach to problem-solving that uses limited resources in an innovative way. Here comes my second blog! A lot of things happened since the last time I wrote, all of them amazing to my delight. I was supposed to be uploading this blog by last week, but since I was busy experiencing all of them amazing experiences I am late on my blog. However, this delay resulted into one more novel experience – snowfall! All the weather apps showed the Orange warning for snow, but me and my friends were just eagerly waiting for it. It was my first time ever seeing snow in person and as cheesy as it sounds, it looked quite magical seeing the little flakes floating down. It was the most breath-taking experience; all my friends went bonkers as we were roaming the streets at midnight enjoying our very first snowfall experience to the fullest. It was like a thousand feathers floating in the air, and when it touched my skin, it just melted. How amazing is that? I know there is nothing unusual about falling snow for most people living in the cold countries but for me and my fellow Indian friends it was a very exhilarating and exciting experience because we never have snow in India. At the same time though, I was also fearful about the cold, strong blowing winds and the drop-in temperature. Last month was a very busy time with lots of things going on in here for Thanksgiving, Science Week, Black Friday, and pre-Christmas celebrations. I am proud to say that I joined two new club s- Taekwondo and Aquatics. Despite the busy schedule with assignments and deadlines, I went for a one-day trail with a Meetup Group to relax and cool off. The host was an Italian guy who wanted to explore the city with different people. There was around 30-40 people in this Meetup from all around the world. 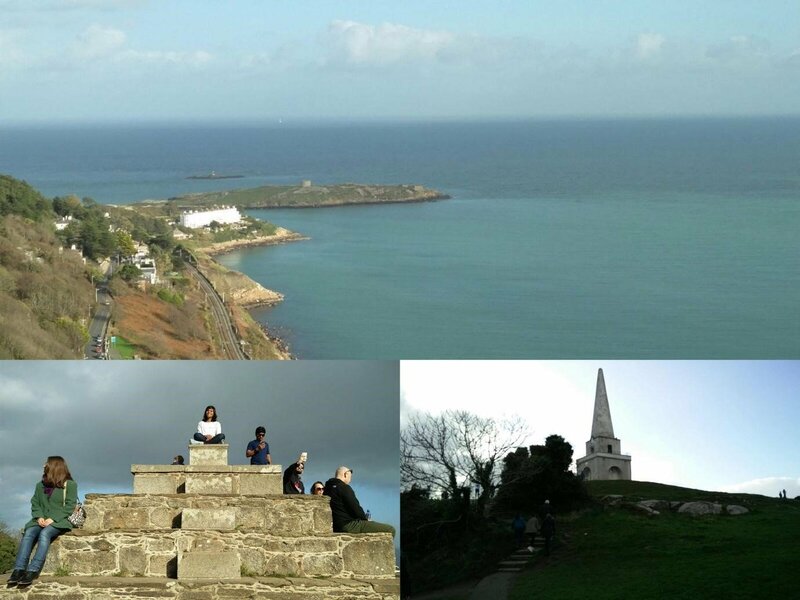 Our meeting point was Dublin Connolly train station and from there we took a train to Dalkey, where the walk started and went to Killiney Hill Park. We enjoyed the beautiful view from the top. After walking for approximately 8kms, we went to Dun Laoghaire to chill out at the People’s Park where there were plenty of food stalls representing countries from around the world. Some people brought their own food, I was one of them. Seriously, budget is an all-time thing studying abroad. Then we went for a few drinks at the Forty Foot Pub since it was very cold outside (or more like that’s the official version haha). There, I had THE best ice-cream at our very own and very famous Teddy’s! Don’t hate me for what I am about to admit but I don’t like ice creams really, but Teddy’s was so awesome. It is THE BEST ice cream. Period. One last thing which I do not want to miss writing in this blog is the Black Friday sale! 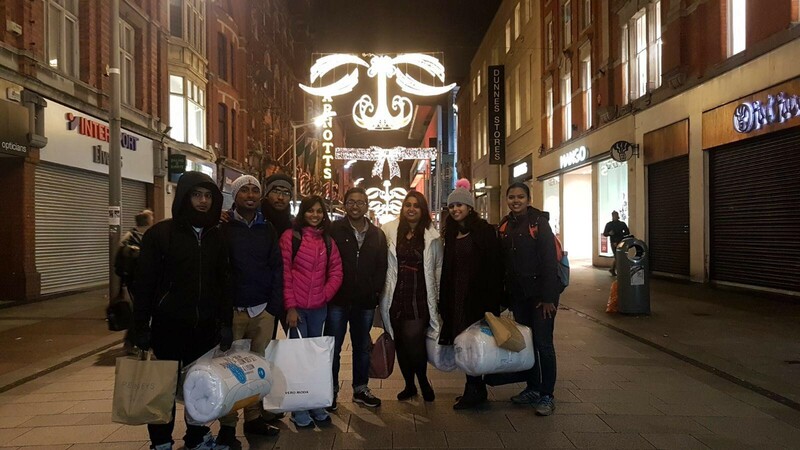 With the coldest winter coming, I had to buy a good jacket, and so my search started early morning when my friends and I went to Liffey Valley Shopping Centre, and then to Blanchardstown Centre, and then to Dublin City Centre! The American tradition of Thanksgiving and Black Friday has become well-ensconced in the Irish psyche but the atmosphere on Ireland’s main shopping thoroughfares was considerably more sedate than the reports of gouging and scuffles over bargains which emerge from some US stores around this time of year. Shops remained busy throughout the afternoon with crowds building on Friday evening as people hit the shops after work to avail of the price reductions. I did get my jacket at a very reasonable price, which is helping me a lot now with the snow and crazy winds every single day! Well, so that was an eventful blog, living this blog was amazing, as amazing as writing about it is, reminiscing about all that is past and merry.